Direct From the Surf Ripped Beaches of Baja comes this authentic "Baja" Hoodie. Each Baja Jacket is made of 100% Eco-Yarn, a material that is proven warm, durable, comfortable and environmentally friendly. 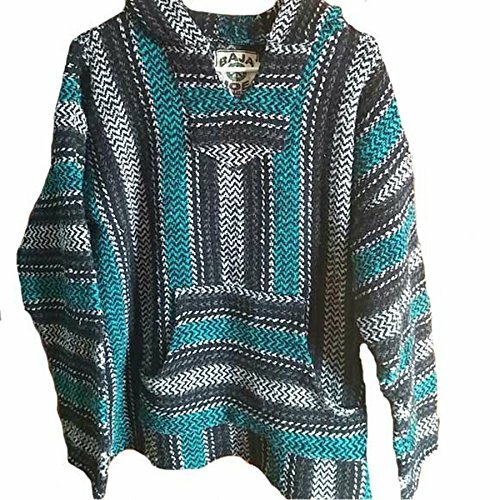 Our Baja Pull over hoodies feature hand made construction and classic surfer styling that have made these hoodies popular from the sandy beaches of the Baja Peninsula to the streets of San Fransisco to the Fields of Woodstock. Each hoodie includes Tightly woven breathable fabric that is warm and cozy. A large, oversized front pouch pocket keeps hands warm and holds you stuff. V-neck adds to breatability and can be tied closed for added style and warmth. A over head hood can be worn up or down! These is no better way to warm up on the breezy beach then throwing on your Baja! 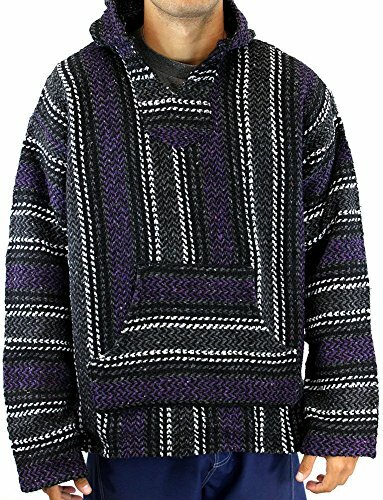 Since these garments are hand crafted no two Baja Poncos are exactly alike. 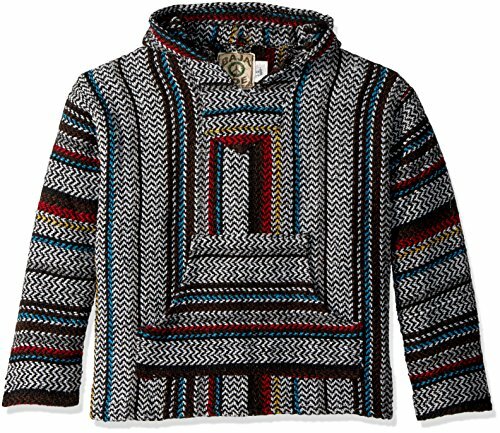 This Baja Joe hoodie by EARTHRAGZ is enviromental friendly, made of 100% preconsumer recycled fibers. For every jacket that you purchase, you are preventing up to 2.4 lbs of textile material from going into landfills. Warm yourself, not the earth. 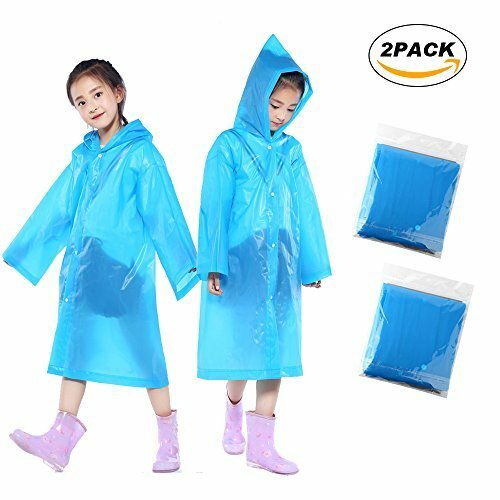 This jacket will shrink so wash in cold water. 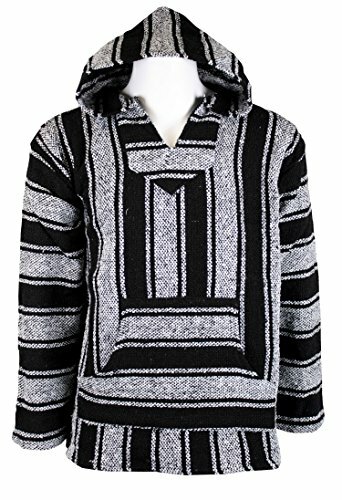 Grab the classic style of the Yankee Forge Baja HoodieHandcrafted in Mexico in a family run business.Our baja shirts are brushed on the inside for extra softness.Warm and roomy.Great as a jacket for those cool nights, or as shirt for anytime. Patterns may vary some due to the handcrafted nature of the product.Hand or Machine wash in cold water, then hang to dry or tumble on low heat.Do no use bleach or iron. Made from recycled fibers - 50% Polyester, 40% Acrylic and 10% Cotton. Includes hood and front pocket to keep you warm. This hoodie has fleece in the inside for a soft feel and to keep you warm. 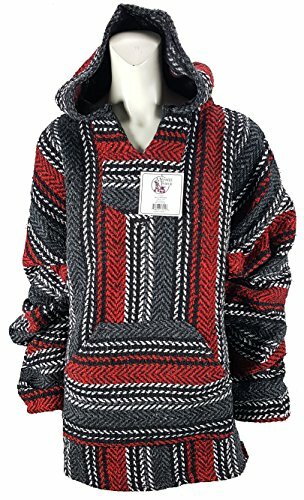 Authentic Mexican hoodie designed for any occasion to keep you covered with a soft feel. This printed rayon poncho makes the perfect beach cover up but can also be dressed up with the perfect white pants.